I’ve mentioned spray paint before, but did you know that it is the way I really started painting furniture about 15 years ago? 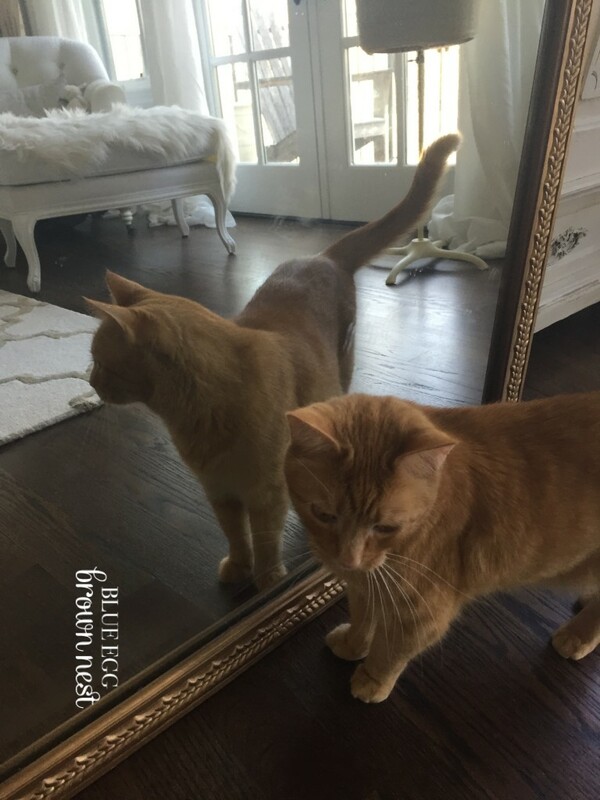 DH and I purchased our first home and it was in need of a complete renovation. We were at Home Depot every single weekend and working on the house after long workdays every week night. We were animals and poured blood and tears into that house. We also hit up every yard sale between our home and the hardware stores on weekends. 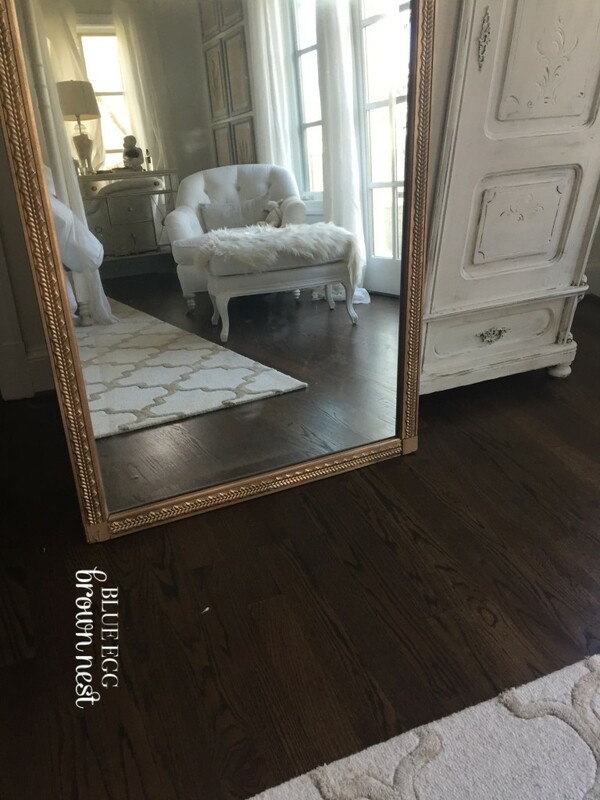 I would buy anything that I could hang on a wall and ANYTHING that resembled a piece of furniture and was in the, well, $20 or under range. We were dirt poor newlyweds. After literally 5 years of renovations, here is my very fav picture. 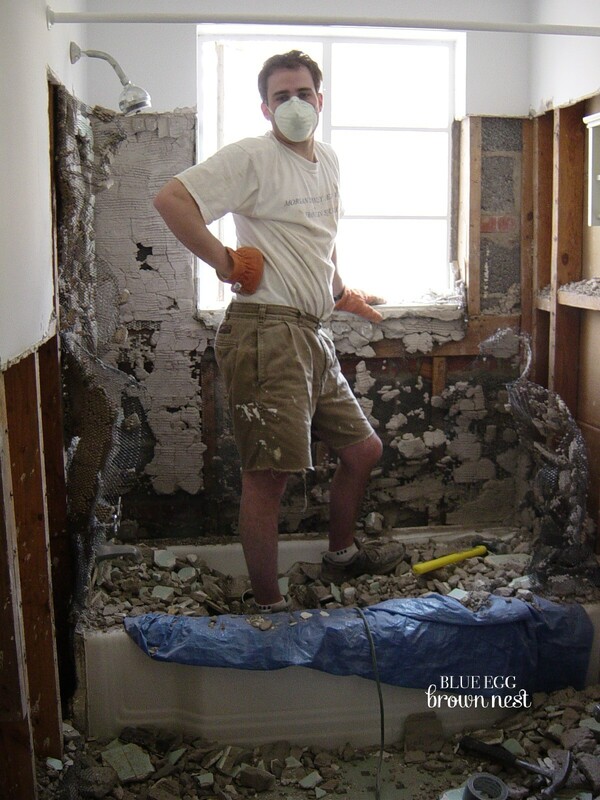 Not every man can pull apart a mint green bathroom like Dear Husband. I cannot seem to find a picture of my first, little side table that I spray painted with black Rustoleum, but I was shocked that such an easy transformation could be made even then. I still love spray paint. You have to go slowly with a steady hand, but it is cheap and easy and gets you quick results. I found a large mirror at Luckett’s that I wanted to use for my daughter’s room. 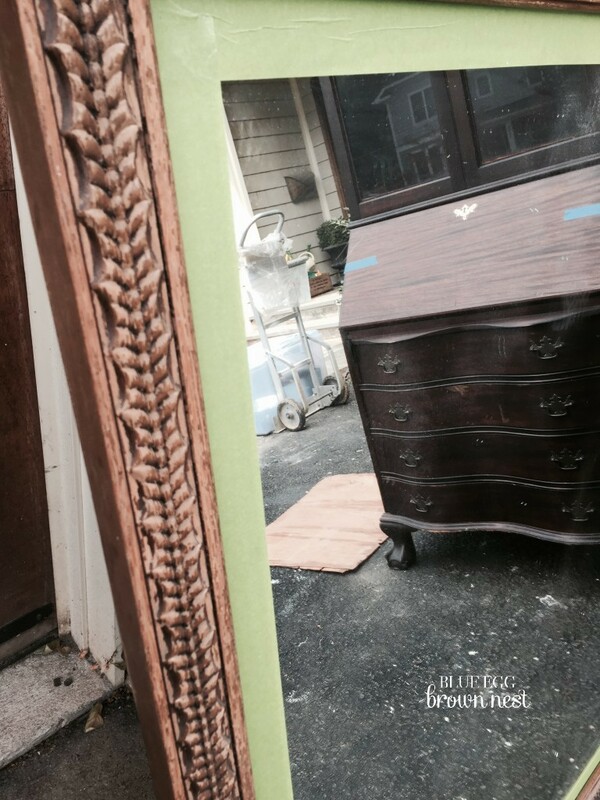 It was a dull, wood and I sprayed – or DH – sprayed it gold. He loves a good spray paint. 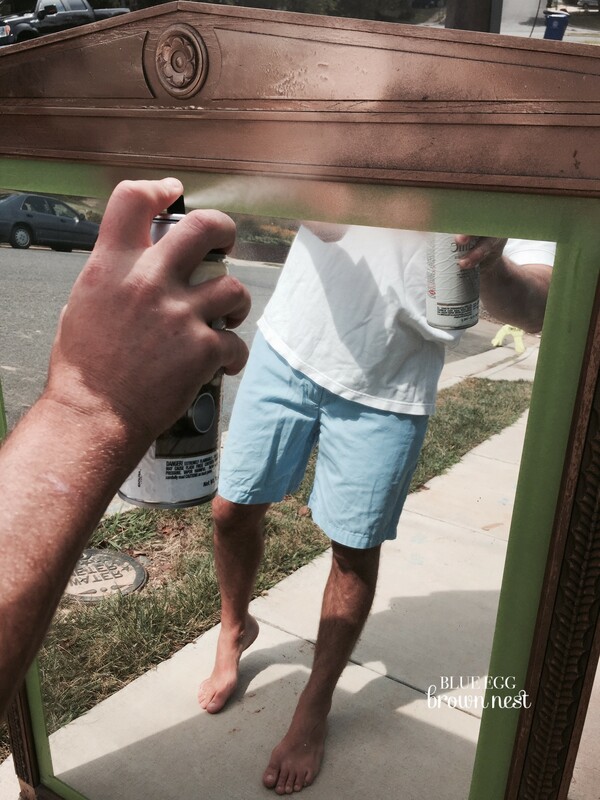 Mirrors are a great item to spray paint because they just involved a frame. 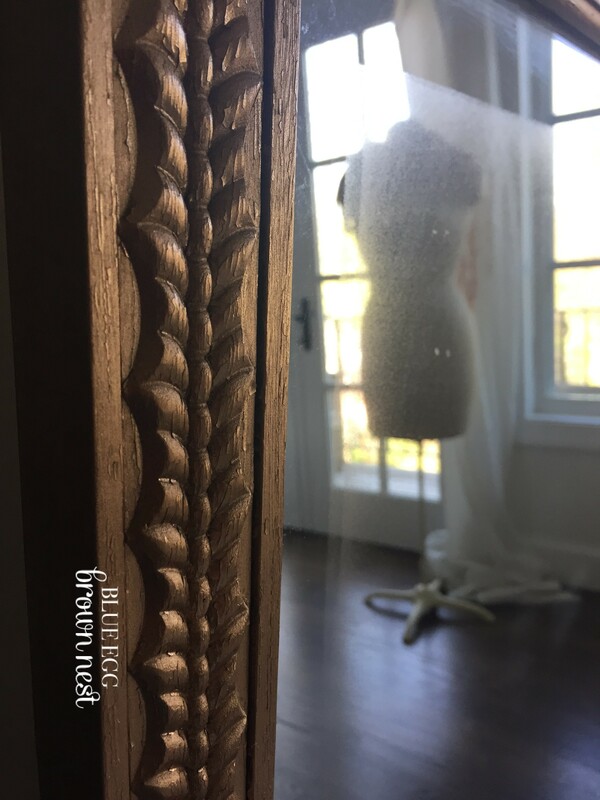 This frame is really interesting with the detail, but even a plain frame can be made beautiful with a can of spray paint. 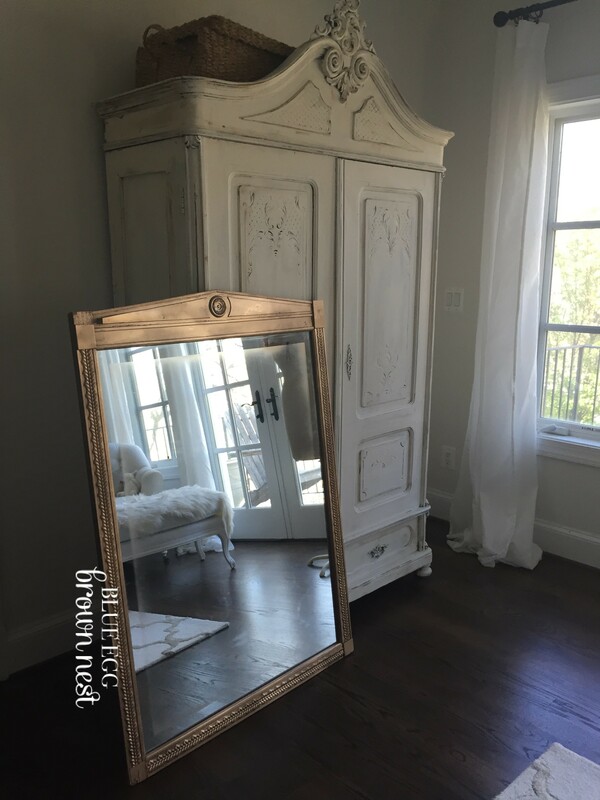 Select a wood or metal mirror (it really doesn’t matter what the material is). 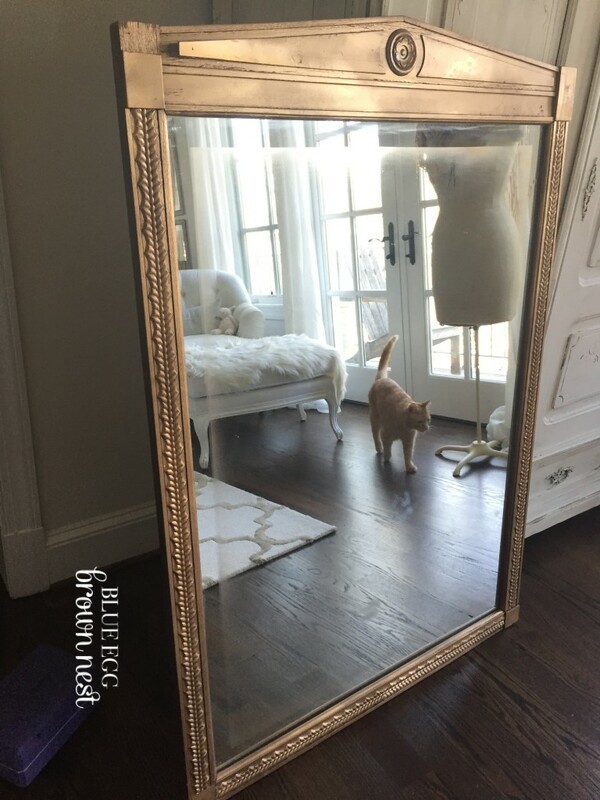 Tape off the mirror part so you do not get spray paint all over it. This will pose a problem if you do and you may get frustrated. Taping is annoying, but do it. We used Frog Tape, but any painter’s tape will work. 3. 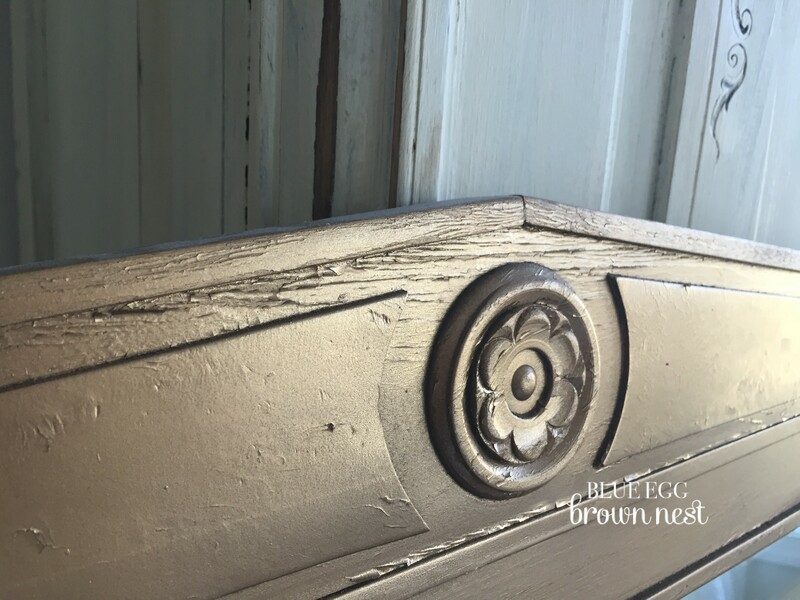 Pick out a Rustoleum paint or the like from your hardware store. We used Krylon here. Use a brand that has a picture of the type of material you are going to paint or specifically says it works on it. 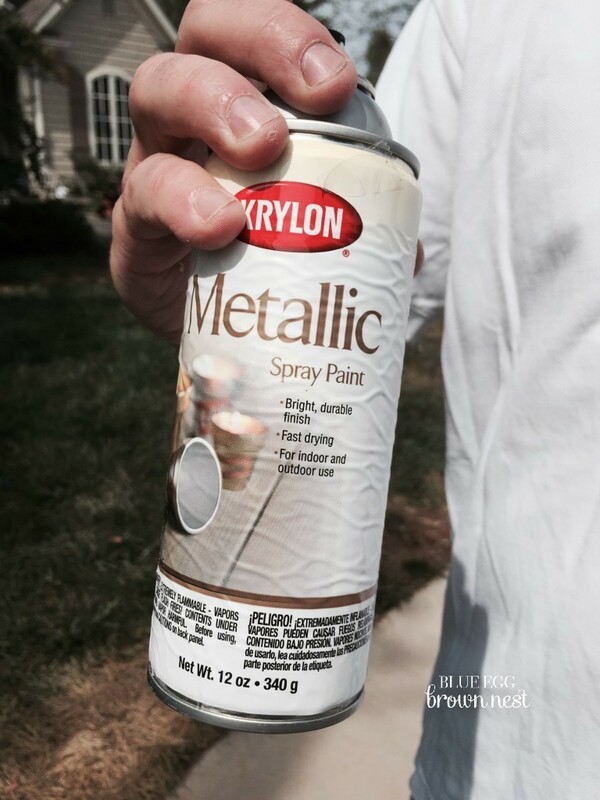 Here is the gold spray paint that I used. 4. Promise me that you will not spray paint indoors! You will get dizzy from the fumes and they will not go away for days! Paint outside and try not to do it on a windy day. If you paint downwind, you will spray paint everything in it’s path. You will realize this when you are sticky, the bushes are sticky and maybe your card is sticky. I may know this by experience. 5. You want to do 2 layers. Spray in a back and forth manner about 5/6 inches away from the piece. Go slowly. 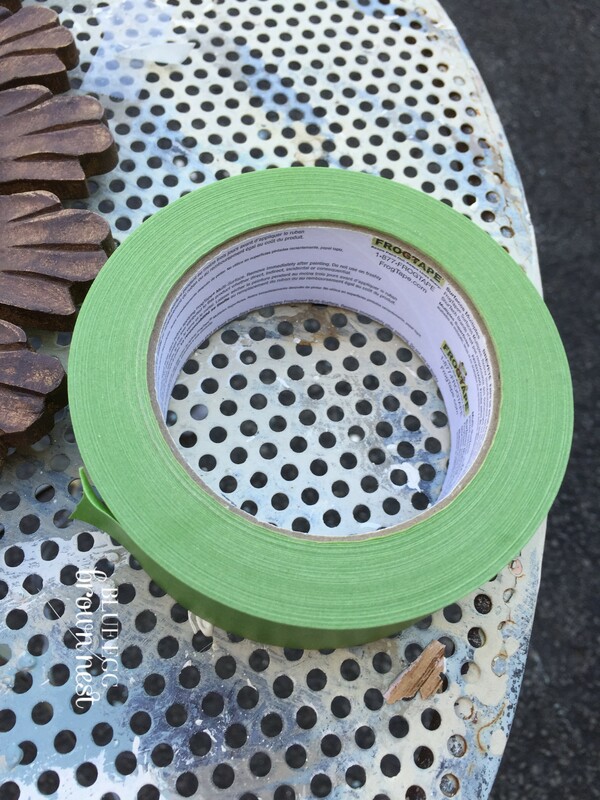 It looks easy, but if you use too much all at once, it will drip and it is VERY hard to fix drips from spray paint! Once completely dry and not tacky, do a second coat. That should be all you need. 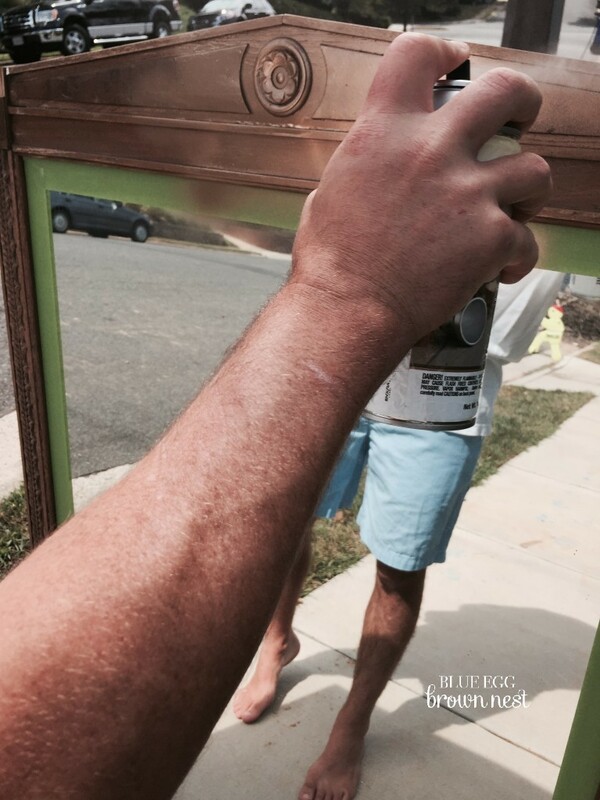 If it’s an old mirror and rather shabby you may see texture. I don’t mind that. I think this is a really inexpensive way to decorate and it takes no time at all. Here is how it turned out before we hung it. What do I love most about this transformation? 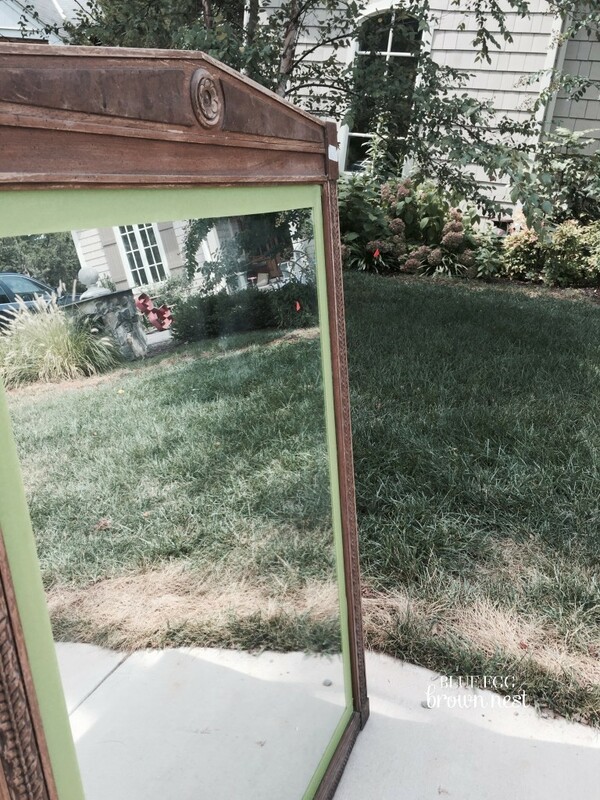 I love that this mirror was sitting on the Luckett’s porch behind a ton of stuff just looking shabby and kinda gross. And now all I see are those lovely details displayed in a beautiful gold! Ahhhh.